aka: NVP-AEW541 is Novartis’ IGF1R ‘Nib been ’round a while, but its off the pipeline? aka: NVP-AEE788 is Novartis’ VEGF / EGF ‘Nib (&src, &flt, etc.) in Ph1 for the last 6 years… and unceremoniously off the pipeline. A quick googlification suggests he has plenty of nice things to say about Brian Druker and his role in Gleevec’s discovery… To his credit he does list Jürg Zimmermann (the named inventor on a series of patents starting with EP564409) as one of the ‘unsung heroes‘ in a history of Gleevec essay. So staurosporine analogs are old news? Novartis has a 1 compound PKC application. 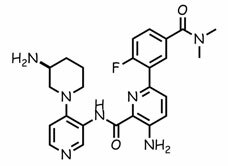 aka nilotinib, AMN-107 is a Novartis’ follow-on to Gleevec. WO/2007/062805 is a ‘multi-target’ application from Novartis that tags the earlier WO/2006/050946 with the Gleevec H1. 11. The use according to claim 10, where the protein kinase modulation responsive disease is one or more diseases selected from the group consisting of diseases, that respond to the inhibition of one or more protein tyrosine kinases selected from abl kinase, especially v-abl or c-abl kinase, kinases from the family of the src kinases, especially c-src kinase, b-raf (V599E) and/or especially RET-receptor kinase or Ephrin receptor kinases, or mutated forms thereof. Novartis mispells it ‘Glivec’ outside the US, but you can call it imatinib mesylate, STI-571, or even CGP-57148 if you like. Discovery: 1992, CIBA-Geigy, Crystallography played no role in the discovery.